For a fella who prides himself on language skills, I have had great difficulty in naming myself and what I do. Firstly, this Jonathan Bob Lynn business. In creating a website some years ago I had to come up with something other than Jonathan Lynn as that name is ‘owned’ by the famed director of ‘Yes, Minister’, ‘My Cousin Vinny’ etc. So, as a tribute to my father and because my second name is also Robert, I tucked in Bob. Recitationist? My friend and web designer Pat Simmonds came up with this lately. I might even like it if I could pronounce it! 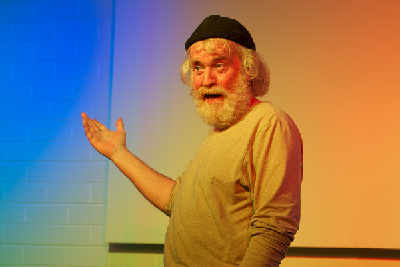 I cannot call myself a Storyteller as the term conjures images of fairies and leprechauns enthralling young audiences. Calling myself a Spoken Word Artist has always seemed pretensious so I continue to struggle to describe my performances of theatrical excerpt, monologue, poetry, song and story aimed at adult audiences. I was raised on the recitation and still rejoice in the memory of being present in boisterous bars or intimate kitchens when all are hushed by the shut-eyed concentration of some old guy’s rendition of ‘Dangerous Dan McGrew’ or ‘The Four Farrellys’. I have become that old guy and am striving to preserve that traditional part of our heritage that needs attention and deserves an audience. I came to Canada from my native Kilkenny back in 1968 and have since been grappling with the rediscovery of my Celtic self through drama with Toronto Irish Players and through music with TIP Splinter. Arm-weary of grappling , I have at last embraced my first love – The Spoken Word. Hardly a traditional storyteller, my celebration of language through verse and monologue, while often original composition, is ever mindful of that Irish reverence for the power and magic of the word. Yet magic and myth are not part of my repertoire so don’t expect those fairies and leprechauns. Do expect Synge, Brian Friel, Sean O’Casey, Patrick Kavanagh, Percy French, John D. Sheridan – words with teeth in ’em! And do expect to laugh. 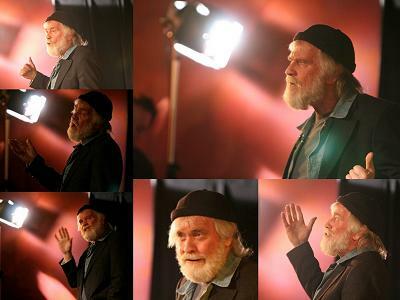 Jonathan Lynn is as good as they come and his one-man show, The Spoken Word, includes excerpts from Robert Service, Percy French, Brian Friel, Brendan Behan, John B Keane and Patrick Kavanagh to name but a few, not to mention his own original work. Jonathan Lynn is a Kilkenny man who emigrated to Canada where he is a set designer with the Toronto Irish Players theatre, among other things. One of those other things is his acting ability. A master of the monologue, wonderful mimic and a musician to boot he entertained a rapt and appreciative audience on a recent visit home. Jonathan Lynn is as good as they come and his one-man show, The Spoken Word, includes excerpts from Robert Service, Percy French, Brian Friel, Brendan Behan, John B Keane and Patrick Kavanagh to name but a few, not to mention his own original work. This was entertainment with a capital E and the man deserves a bigger audience than Bollards which was chock-a-block. Perhaps our Arts Festival folk might take a look at this talented man, this local talented man, and find a spot for him in next year’s festival. Kilkenny Castle Tower would be a perfect venue and Jonathan Lynn I guarantee you will not disappoint. Gerry Moran Column, Kilkenny People Aug 28th 2008. Thea Award winning actor, playwright and designer with Toronto Irish Players. Author/director of a series of one-act plays and recently presented the full-length play ‘The Warrior Bard – a celebration of ‘Moore’s Melodies’ at The Alumnae Theatre in Toronto. Founder of TIP Splinter, Irish Traditional group who performed throughout Canada, U.S.A. and at The Rose of Tralee Festival in Ireland playing banjo, hammer dulcimer, mandola and clarinet/sax. 7 Music Albums recorded including a solo album of original songs. Remembered as TV producer with Rogers Television and hosted weekly music series called “Highway 10” for 13 years. 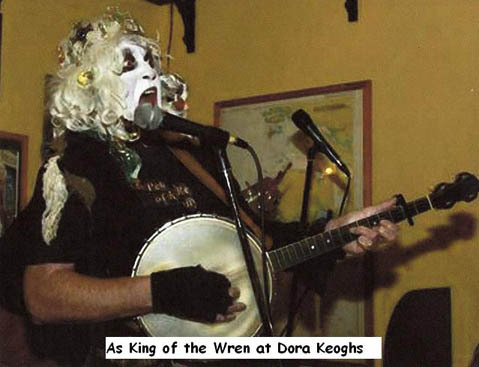 Founder and “King of The Wrenboys” for 30+ years. Now retired but the tradition continues at Dora Keogh’s on Boxing Day.